Crowd-pleasing party recipes-without the guilt! With a third of Americans on a diet at any given time, planning party menus can be a challenge for any host. 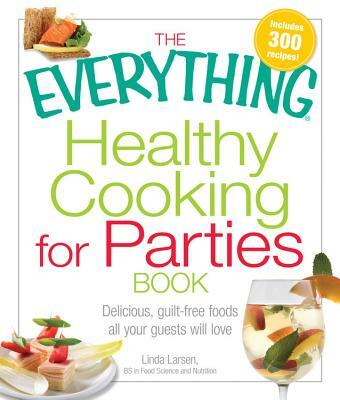 The Everything Healthy Cooking for Parties Book has something for everyone. These 300 healthy recipes will teach you how to use low-fat, high flavor ingredients to create party foods that are good and good for you! Creating scrumptious dishes that are a delight for all the senses has never been easier. Well-fed guests are happy guests, and your friends and family will never go hungry with these recipes. Go ahead; tell your guests its okay to indulge at your parties! Ms. Larsen holds a degree with high distinction in food science and nutrition from the University of Minnesota and a BA in biology from St. Olaf College. In addition to her many cookbooks, Ms. Larsen has written articles for Woman's Day and Good Housekeeping, and is the About.com Guide for Busy Cooks.